Hyaluronic acid is responsible for intracellular water retention, supporting a normal water balance, making the skin supple and elastic. Its production decreases with age and sun exposure. The skin becomes dry, thin, flaking and wrinkles appear. That’s why the Korean cosmetic market is full of treatments with hyaluronic acid in the ingredients. All of them attempt to make up for its loss. Effective Korean ampoules with hyaluronic acid. MIZON Bio Hyaluronic Ampoule contains 50% concentrated hyaluronic acid blend. link eBay. Scinic Hyaluronic Acid Ampoule 95 contains 95% concentrated hyaluronic acid blend. link eBay. The Saem Power Ampoule Hydra – hydrating ampoule for sensitive skin. link eBay. What should you expect from hyaluronic acid products? Treatments with hyaluronic acid deal with hydration better than other similar products. The effect is visible from the very first use – the skin is hydrated and supple. Do not believe the flashy advertisement promises. Treatments with hyaluronic acid will not smooth out deep wrinkles. With proper hydration, fine lines will be less visible. And if you start using hyaluronic acid at 25, when there are no wrinkles yet, then quality hydration will prevent their formation. Hyaluronic acid has anti inflammatory and healing properties, aids in the growth and regeneration of tissues, improves the permeability of cellular membranes, ensures proper cellular functionality. Suitable for daily use for all skin types. Hydration for all skin types, including sensitive skin. Does not cause allergic reactions or irritations. Hyaluronic acid is completely safe and has almost no contraindications. 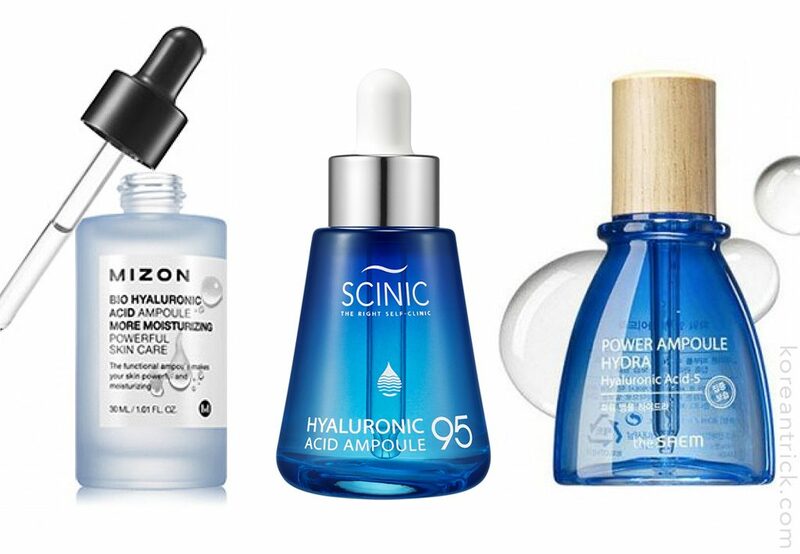 How to use hyaluronic acid properly? Hyaluronic acid is a so called moisture catcher, absorbing the outside moisture and helping avoid water loss. But in the dry climate or with the use of indoor heating, this ingredient, instead of absorbing the surrounding moisture (because it’s almost nonexistent), pulls it from the deep layers of the skin. That can cause a tightening sensation. That’s why it’s so important to use hyaluronic acid ampoules and serums correctly. It’s best to apply them to moist skin immediately after cleansing. It is imperative to use another cream with trusted hydrating ingredients (glycerin, plant oils and extracts) on top of the ampoule. Otherwise, the ampoule will pull the moisture from the skin, which will cause an even greater loss of hydration (totally paradoxical). The cream seals the ampoule and prevents moisture from evaporating. Sheet and hydrogel masks with hyaluronic acid are very popular. They can quickly get the skin in good shape, hydrate and freshen the face. Atomy 7 solutions gel mask – universal hydrogel mask. link eBay. 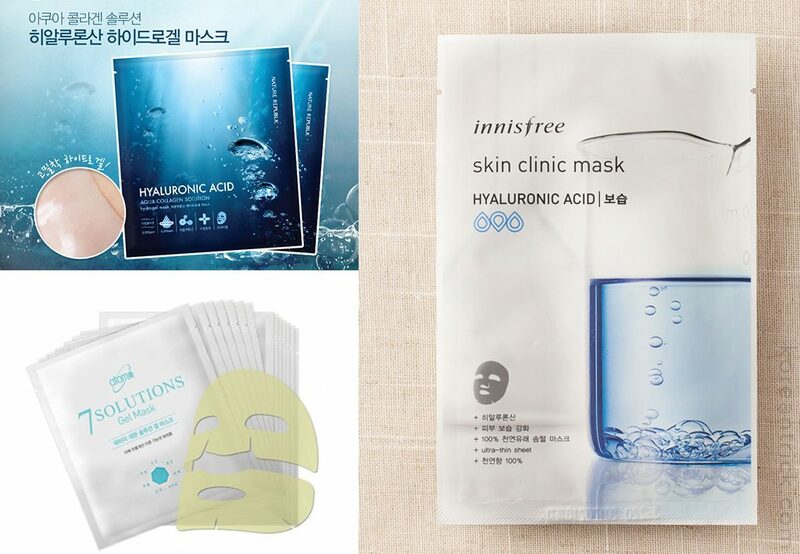 Innisfree skin clinic mask – hyaluronic acid. Sheet mask with hyaluronic acid. link eBay. NATURE REPUBLIC Aqua Collagen Solution – hydrogel mask with hyaluronic acid. link eBay. Hydrating lines with hyaluronic acid. It’s skin Hyaluronic Acid. Vitalizing ultra hydrating line neutralizes free radicals, “postponing” the aging process. Quickly increases hydration levels, normalizes hydro balance, smoothes the skin and evens out the skin tone. Stimulates collagen synthesis, activates skin’s natural regenerative processes and strengthens the immune system. link eBay. A’pieu Essential Source – hydrating line with hyaluronic acid, enriched with mineral water full of mineral salts. These play a vital role in biochemical reactions within the skin layers. Mineral water hydrates and nourishes the skin, filling it with necessary microelements, strengthens and tones. link eBay.